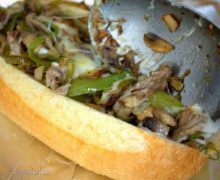 Thinly sliced strip steak is paired with green peppers, onions, and mushrooms, then topped with cheese and stuffed into a hoagie roll. 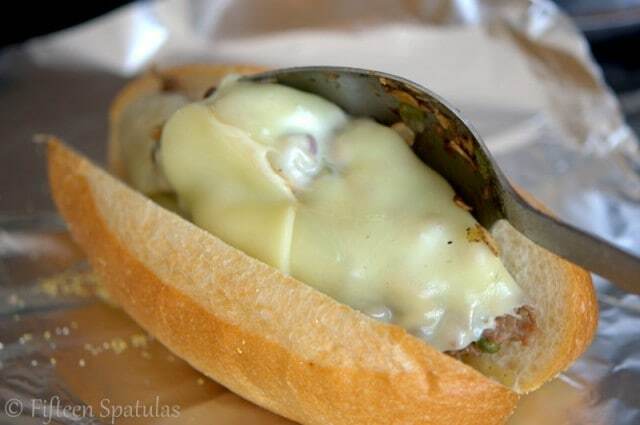 These cheesesteaks are a great hot treat for lunch! A mess of thinly sliced strip steak with peppers, onions, and mushrooms, melted with cheese and stuffed into a hoagie roll. Or at least, that’s MY cheesesteak sandwich. 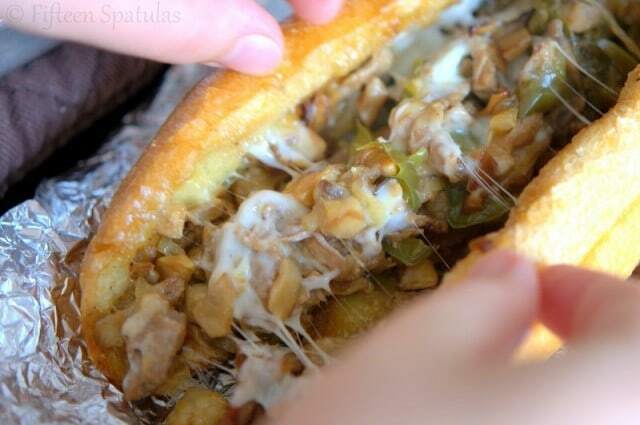 Cheesesteaks were one of the tastiest things I ate growing up. But I don’t think we ever had them with peppers, onions, or mushrooms. I was the kid who scraped the onions and peppers to the side of my plate, hoping my mother wouldn’t make me eat them. But over time I’ve come to love them, and to me they are all essential in this sandwich. Caramelized onions, caramelized green AND jalapeno peppers, and browned mushrooms. Top big spoonfuls of the beef veggie filling with sliced cheese. But well, I think it needs both. And shove each hoagie with a big spoonful of the filling. Wrap each hoagie tightly in aluminum foil and toss it into the oven for 15 minutes. Freeze the strip steak for 30 minutes, and prep and cook the other ingredients while you wait. Freezing the steak is a little trick that makes slicing the steak MUCH easier for you. In a large skillet, heat up the olive oil and butter over medium heat. Throw in the onions and season with a pinch of salt and pepper. 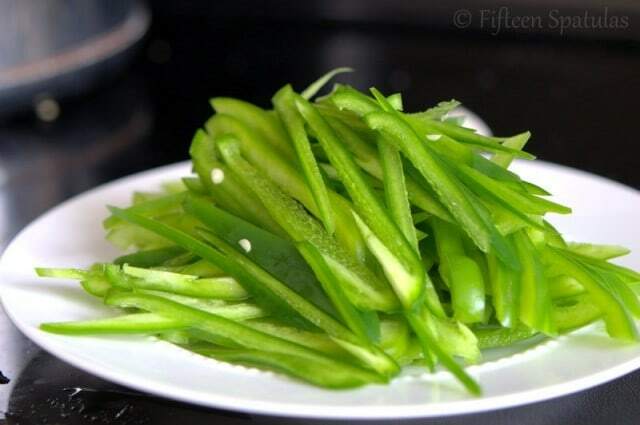 Cook for 20 minutes until translucent and soft, then add the peppers. Season with a little pinch of salt and pepper. Cook the peppers and onions together for 20 more minutes until everything is softened and sweet. While that cooks, slice the strip steak into very thin slices. Season the slices with a good sprinkling of salt and pepper. Set aside. 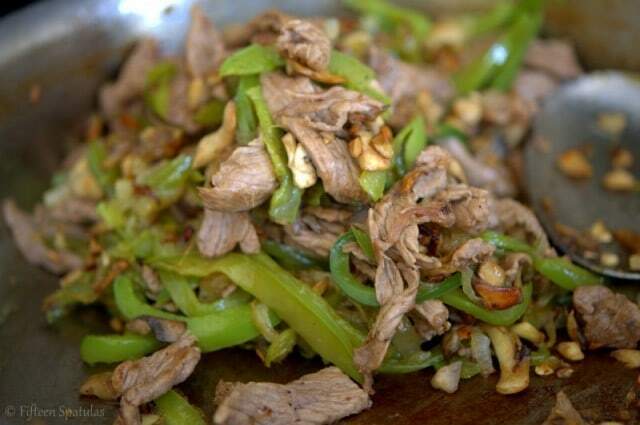 Remove the onions and peppers to a plate, then heat the pan to medium high. 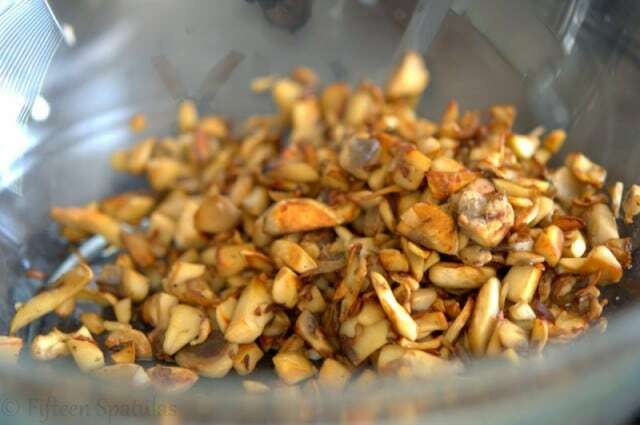 Add the mushrooms one handful at a time, and cook for about 5 minutes until they turn brown. If there is mushroom water pooling around in the bottom of the pan, your pan isn’t hot enough, or you’ve added too many mushrooms to the pan at a time. Adding the mushrooms a handful at a time ensures that you don’t overcrowd the pan and cause the mushrooms to steam instead of brown. 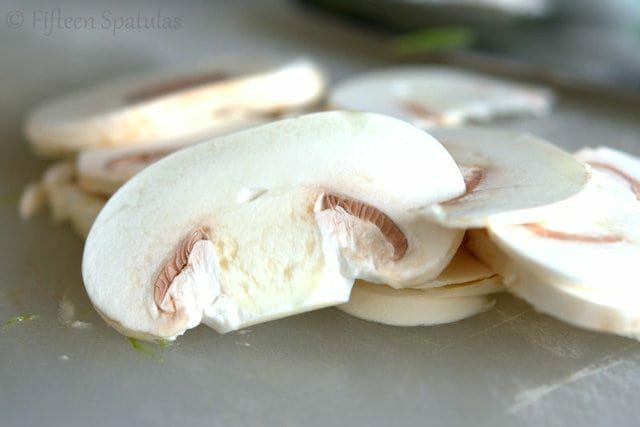 Remove the mushrooms to a plate. Add the steak slices to the pan, cook for about 30 seconds on each side just to cook it through. Turn off the heat (but keep the pan on the burner), and add the reserved cooked onions, peppers, and mushrooms. Divide the filling into four sections, and top each section with two slices of cheese. Give the cheese a minute or two to melt, then spoon each of the four sections into one of the four hoagie rolls. 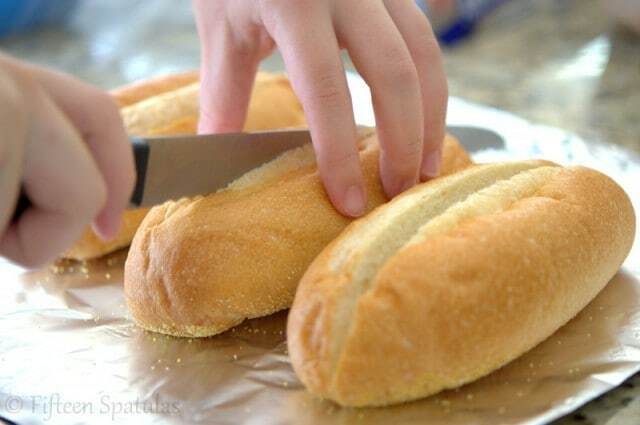 Roll each filled hoagie very tightly in aluminum foil, and toss them in the oven for 15 minutes. 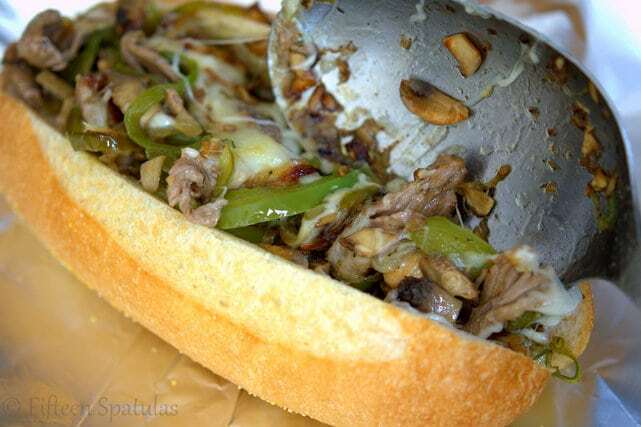 Eat the cheesesteaks while they’re hot and gooey from the oven. Enjoy! I, too, am greedy for cheese. This looks delicious! Hi! I was wondering if you could clarify adding mushrooms “a handful at a time” – how long do you wait between handfuls? I’m looking forward to trying this! Thanks! Hi Jane! So here’s the deal. It really depends on how hot your pan is and how big it is, but I usually add it all over the course of 4-5 minutes. But basically if you just dump all the mushrooms in at once, the pan will probably be too crowded and all the water from the mushrooms will steam each other in the pan, and they won’t get brown. Add a handful and wait a moment, and if you see water pooling in the bottom of the pan, don’t add the next handful yet. Wait until that water has evaporated. By waiting until adding the next handful you give that water the space and chance to evaporate. If there’s no more water in the pan then you can add the next handful, and keep going with it. Does this help clarify? Let me know!